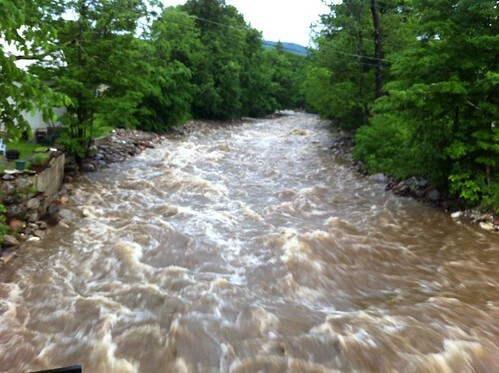 Yesterday the Middlebury River finished what it started during Tropical Storm Irene last summer. Torrential rains - probably up to 4 inches in places, fell in just a few hours, accompanied by incredible lightning. The river quickly rose, and the small bit of earth keeping the river from shifting course quickly was washed away. The oxbow I've been watching for nine months has now cut. It has been said that we first feared nature, then conquered it, then set out to protect it. There's a quote to that extent, I don't remember by who. The truth, of course, is much more convoluted. Last Tuesday, a long period of steady rain got the Middlebury River flowing pretty strongly, though not at flood plain stage. The same oxbow cut I have been watching since Irene was experiencing some erosion, and we could hear rocks 'clunk' as they rolled over the backcut. 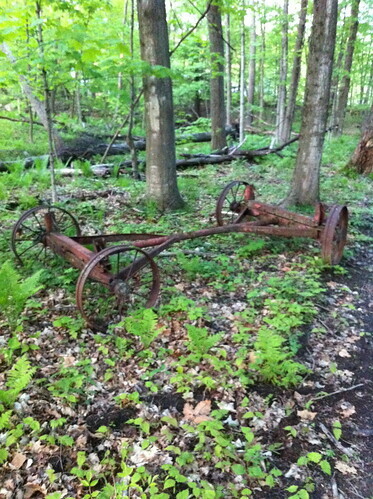 Still, the remaining tree roots in the soil held strong, and the oxbow was not cut. 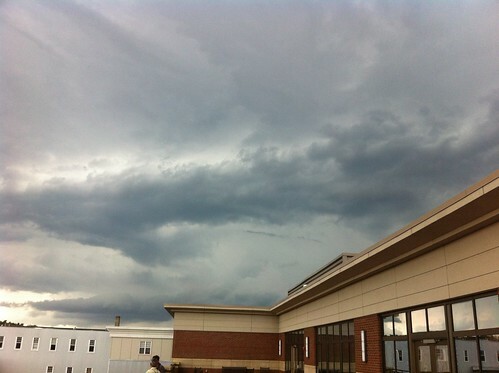 On Wednesday, severe thunderstorms were in the forecast. In fact, all of Vermont was within a severe thunderstorm watch. 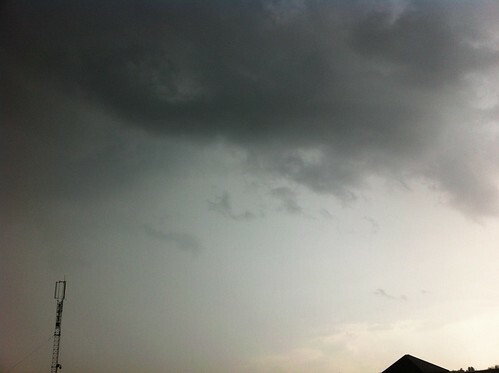 By mid-morning, it was quite hot and humid, and it felt like perfect thunderstorm weather. Soon towering cumulus (cumulus congestus) clouds started forming over the mountains to the east. It was not these clouds that brought the storms, but clouds moving in from the west. Soon after, another, even more intensive storm swept by to the south, crossing the lake somewhere near Bridport and slamming through Vergennes, Monkton, and Hinesberg, squeezing right into the narrow Winooski River valley near Richmond, and expending most of its remaining fury on Bolton Mountain. It's a bit hard to see in the above photo, but there were definite orange-ish and green-ish hues to the cloud. Often these colors foretell hail within the storm - and in areas like the Midwest, also the possibility of a tornado. There were no tornados reported in Vermont (and indeed they are thankfully quite rare here) but there was apparently quite the hailstorm along the Chittenden-Addison county line. Matt Sutkoski, who writes for the Burlington Free Press including the Weather Rapport blog, mentioned the scud clouds in this recent post. 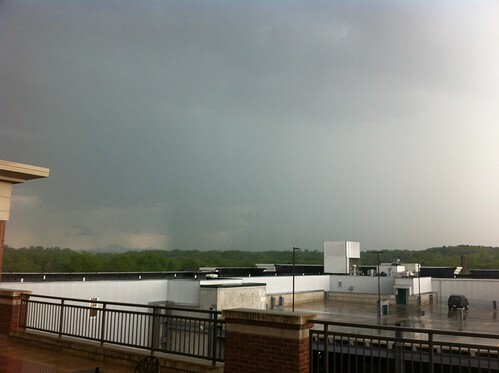 While these scud clouds WERE associated with a severe thunderstorm, scud clouds aren't always associated with severe weather. 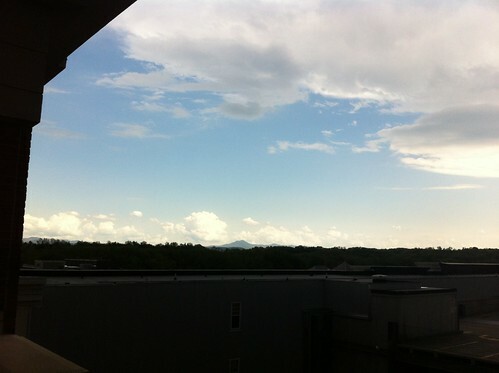 We often see them when storms bump up against the mountains, because they are caused by rising warm air. Sometimes you can actually watch them flow upward into the main storm cloud, and other times they quickly form and dissipate. 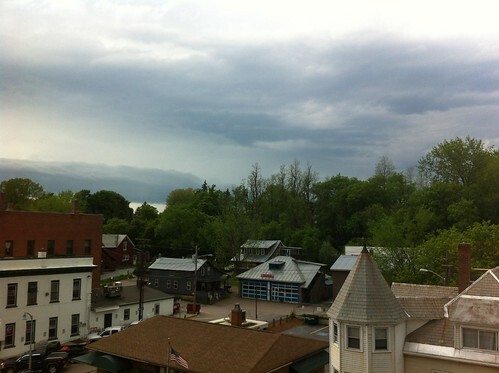 In Winooski, lightning was often visible, there was a bit of thunder, and we had a few surges of moderate rain. But, it never got very heavy. I was amazed when traveling home to East Middlebury later that evening, because the creeks were raging! Little Otter Creek and Lewis Creek were especially high and full of muddy water. Yet, the New Haven River was barely up at all and the Middlebury was just flowing at the normal 'slightly high' level you would expect the day after getting a half inch of rain. The ground wasn't even that wet. Of course, the oxbow cut didn't break, because the river didn't even rise. (see here for the link). You can see that Winooski was in a 'hole' that picked up almost no rain, and East Middlebury was too far south to get much out of these storms. The area in between, on the other hand, actually was hit by TWO storm cells, as you can see in this archived radar animation. 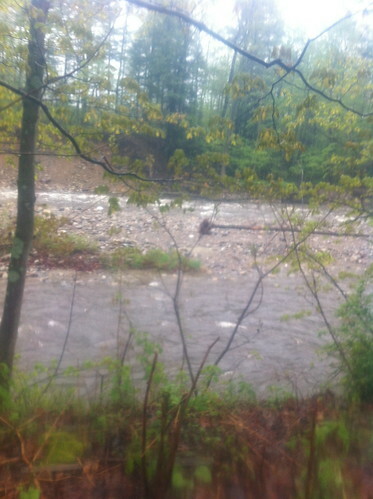 If those storms had hit Ripton instead, perhaps the oxbow would have cut through. Since Wednesday, the weather has been beautiful. 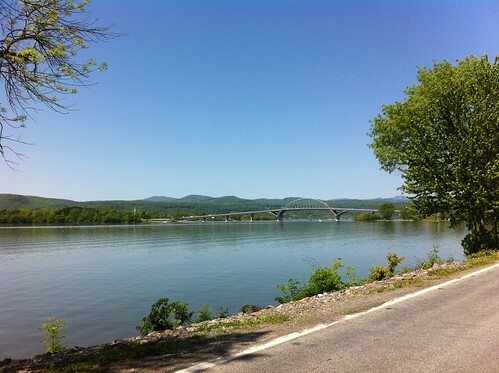 This weekend, there was a festival for the newly rebuilt Crown Point Lake Champlain Bridge. The festival is near its end and the entire time there was beautiful weather. It's in the mid 80s now, and I'm planning the first sandals-and-shorts river explore of the season after I post this blog entry. The water is still COLD but when it's 85 out, who cares? I don't think I'll jump all the way in though... yet. The combination of rain and warm sun has turned the Green Mountain State a very vibrant green. Summer is here - or at least is close. In the next week or two, we will probably see the fireflies coming out in force. I haven't seen any in Vermont yet.. have you? After a very dry early spring, the rains have returned, and with great force. So far, May has been much wetter than average in most of Vermont. 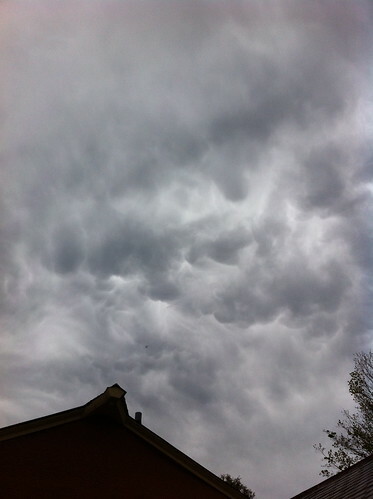 Above: mammatus clouds on the last evening of April, marking the start of a wet May. 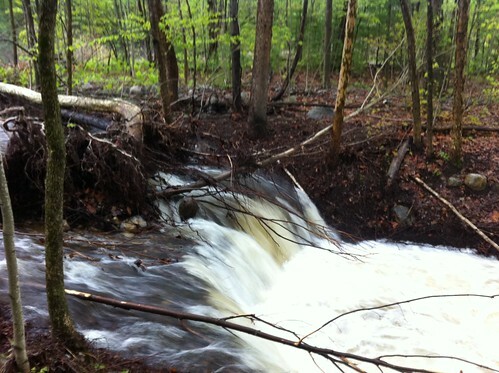 Early last week, a drenching rain dumped water on already-wet soils, causing the rivers to rise. The Middlebury River was nowhere near the levels reached during Tropical Storm Irene, but the water was perhaps the highest it had been since that storm, since we didn't have much of a spring snowmelt season this year. I didn't get a picture of the river at its highest, because the waters peaked at night, but below you can see the river as the waters rose. 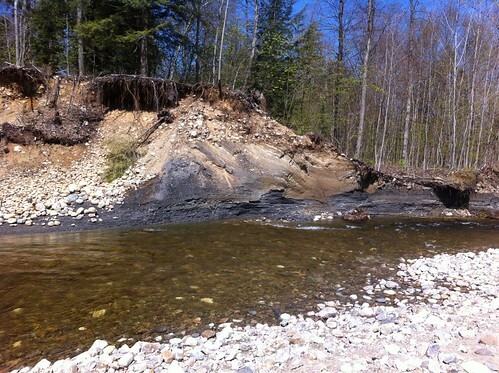 The high water flowed through vast deposits of sand and gravel moved about by Irene's flooding, as the river set into a new course. Swimming and fishing holes were scoured out, a few crumbling banks gave way, and the river acted how one would expect after two heavy inches of rain, but the water stayed in the lower floodplain. 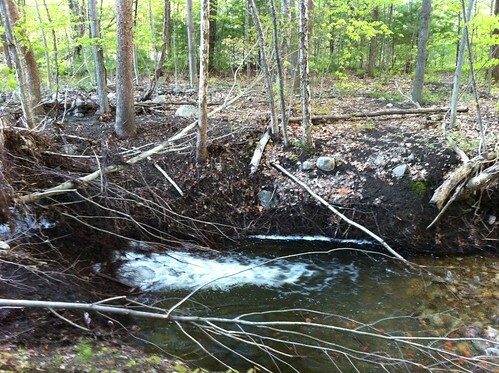 Despite all of the concerns circulating after Irene, I don't see any evidence that there is 'too much' silt in the river. The big floods bring in the silt, and the smaller ones move it away. Over the longer scale, the movement of sediment is certainly an issue, and a good plan will help the city of East Middlebury determine the best way to coexist with the river. In the mean time, the most important thing is to make sure the structures protecting homes, roads, and businesses are solid and well-maintained. Below you can see that the cut has eroded beyond the area protected by tree roots, and has undermined the downed trees in the river. Beyond is the main flow of the river. It won't be long now before the river shifts, because the new channel is lower, and a more direct path, than the existing channel. Rain is forecast this week, with a couple of inches possible, and I'd not at all be surprised if by next weekend the river has a new route. The slow rate at which this oxbow has been cut shows just how powerful trees are in reducing erosion of riverbanks, both when they are rooted in the bank and when they have fallen. Any removal of 'debris' or cutting of live trees hanging over the river in this area would have resulted in this erosive process having happened much more rapidly. In this particular case the shifting of the river is occurring on an unpopulated floodplain, but in many cases trees are removed from riverbanks near homes and roads. 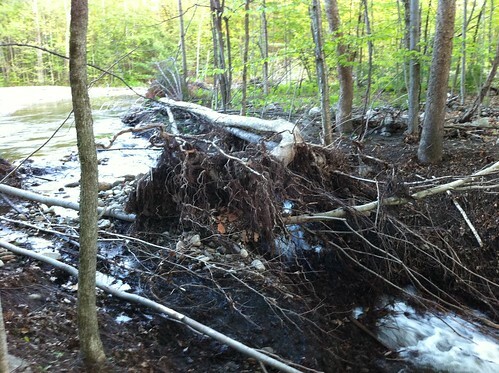 There can be good reasons to removed downed trees from a river, for instance if they are jamming under a bridge and causing a danger of bridge failure, but in general we should think long and hard before doing so. 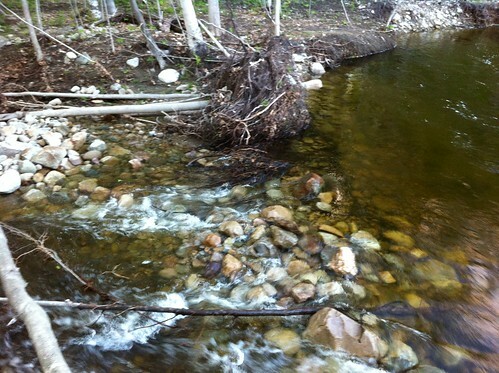 Above: a root ball of a fallen tree keeps the river in its current path... for now. The imminent shift of the river doesn't appear to be a threat to any structures nearby. I am not sure who owns this area of land, and because property lines do not move like rivers do, it could cause land ownership confusion as dry land and the river switch places. No one owns the riverbed, but when the river moves, and old riverbed becomes dry land, does the owner of the new river get the old riverbed? Does one person get more land and the other less? I don't actually know the answer to these questions, but I'm sure they are coming up all over Vermont in the wake of Irene. 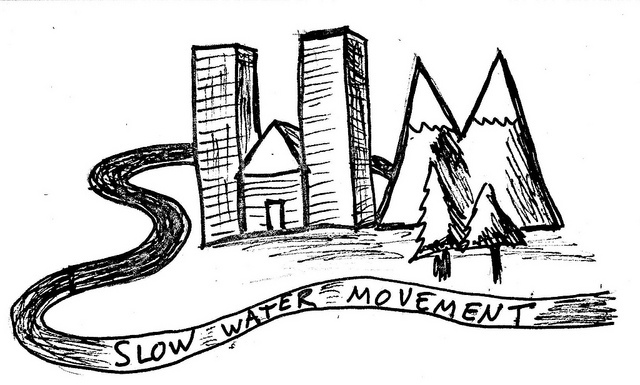 It's not really possible to keep a river in the same place in the long term, but it's no easy task to move our lives around as the river moves. Some people who live near rivers have adapted their cultures to simply move with the river, but that doesn't work very well with Vermont's brick and old-mill architecture. 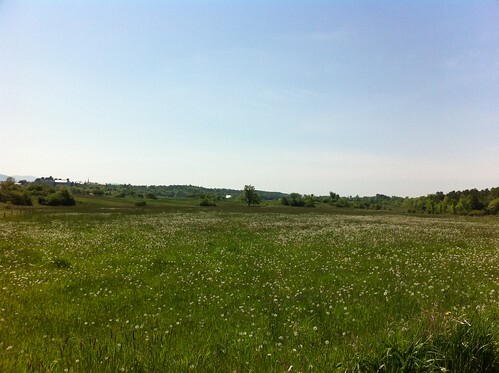 In some cases we can convert floodplain land back to open space, seasonal farmland (like the Intervale in Burlington, which floods on a semi-regular basis), or perhaps some sort of fiddlehead, venison, trout, and firewood working landscape permaculture - rather than the normal US dichotomy of factories, concrete, and factory farms or untouched and untouchable 'wilderness'. Still, in many cases our towns are built right on the rivers, so we just have to do our best to protect ourselves and let the river do its thing (because that is going to happen regardless). 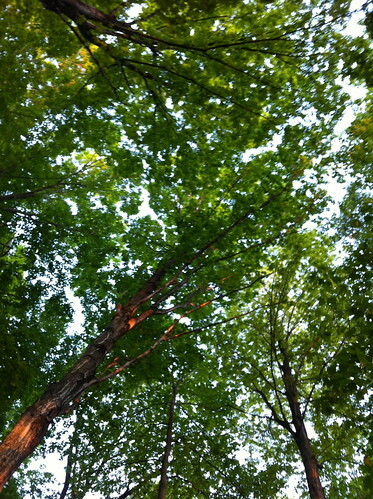 Above: maples in the May evening light. 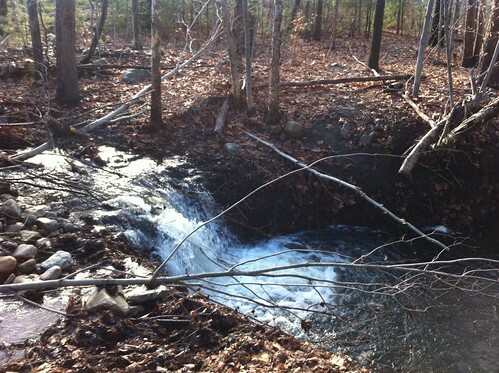 Could a floodplain be used for production of numerous forest resources (syrup, fiddleheads and other edible plants, trout, venison, firewood, recreation, and flood control) and provide livelihoods as well as ecological value? In any event, the oxbow cut is a place I go to reflect on the often unpredictable but always inevitable nature of change. In the short term, and in the long term, rivers will shift. People could try to stop it, or could speed up the process, but it will happen regardless. The Middlebury River flows through mountains that formed long before the first dinosaur set foot on this planet, and the river has probably meandered across the Champlain Valley in every interglacial period of the last few million years. When the ice comes, the river flows beneath the glaciers, and when the ice melts it is uncovered. Of what consequence is a mill dam, levee, or concrete lining to a river that has seen hundreds of thousands of storms like Irene, and even more massive floods unleashed by the melting of glaciers and release of glacial lakes? If we 'damage' the river, we simply put ourselves in danger or throw away the chance for us and our children to enjoy it. The river will continue to be a river long after our species is forgotten or has moved on to something else. The more we understand it, and make its natural processes a part of our life, the more of a resource to us it can be. Long after everything we have built has rusted away and crumbled, the river will continue to wander across this wide valley carved into our planet. 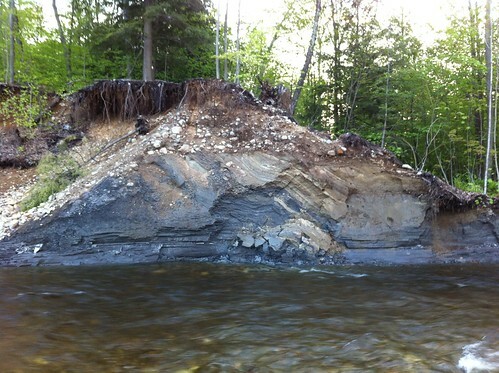 The day Tropical Storm Irene blasted through Vermont and the Middlebury River flowed down East Main Street seems far in the distant past, but Irene's effects are still visible on the landscape. There are still roads with patchwork paving on them (even more so than usual), piles of sediment pushed off of roads and driveways, crumbling eroding riverbanks left by the flood, and smoldering arguments about how to repair damage and prepare for the next flood without sacrificing the Vermont way of life or damaging our rivers. In the longer term, there is also an invader that has been spread by the flood - Japanese knotweed. Japanese knotweed is an odd plant. 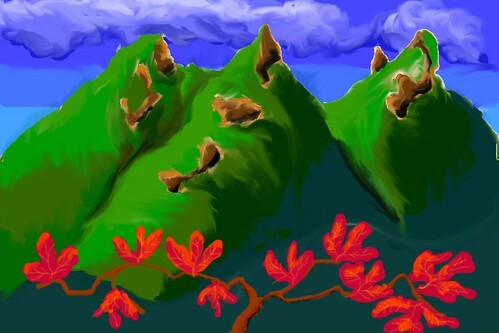 It thrives along rivers and streams. In the spring, it sprouts from the ground, as seen above, in succulent shoots that look a bit like giant asparagus. They are apparently edible at this life stage, but be warned: don't eat knotweed in an area where people have tried to kill it with pesticides. As the stems grow a bit larger, they sometimes grow to resemble bamboo, though they are not very closely related. Then the plant sprouts huge leaves. Eventually, the plants bear big white flowers, and then when fall comes the plant dies back to its rhizomes. In the winter only dead stalks remain. So what's wrong with Japanese knotweed? It's edible, funny looking, has flowers, we should be glad to see it along our streams, right? Well... maybe we would be, except that it is outcompeting the other plants that grow along rivers, such as willows and cottonwoods. It also has shallower roots, meaning it doesn't hold the banks up as well. If all of our rivers become lined with knotweed, it may be one more factor leading to increased flooding. Above: Knotweed along the Mad River. In Vermont, Japanese knotweed is an invasive species. Invasive species are one of the most confusing, controversial, and difficult to deal with issues in ecology and land management today. It's not entirely understood why a species becomes invasive, but many features come into play including a lack of predators and pathogens compared to the species they are outcompeting; human disturbance favoring the spread and survival of disturbance-loving species; fragmentation of habitat; changes in the climate; and perhaps even a form of 'cheating' - not connecting to and adding to the symbiotic fungal mycorrhizal network that is present in intact ecosystems. Some focus on the fact that most invasive species are non native (have been introduced to an ecosystem by humans), but most non-native species introduced to an area do not become invasive, and sometimes native species do become invasive when conditions change. As with other threats facing our ecosystems today, the magnatude and number of invasive species has created a problem much more severe than might occur naturally. Certainly species sometimes naturally invaded new habitats and crowded out other species, but never before this period in our planets history have so many species been moved around all at once. The real answer to why invasive species occur and how we could manage them may be found in the emerging field of complex systems. This field addresses how small 'units' following relatively simple rules can result in incredibly complex phenomena as they interact. Examples are found in natural ecosystems, within computer simulations, in our economy, and within our own bodies. In all of these cases, incredible complexity and beauty can develop in surprisingly diverse ways. Also in all of those cases, complexity can result in equilibrium and surprisingly resilient systems, but a small change, if in the wrong place, can cause the entire system to crash. Diversity and complexity are lost and the system is dropped to a much less diverse and more unstable state. We see this when our computer systems crash, when economies collapse and when a few companies dominate everything, and even in our own bodies when diseases invade our bodies. In some ways cancer also acts in this way, and the fact that it originates with our own cells makes it no less horrifying and heartbreaking. As with cases where native species become invasive, cancer can be set off by disturbances in our body such as carcinogenic toxins - but of course there are times when we have no idea why it occurs. I've lost too many people I love to cancer, and have watched others fight it off at the cost of years of painful battle. My point here is not to say that knotweed along the river is as 'bad' as cancer, but simply that there is a unity in how complex systems work. Perhaps studying and understanding why knotweed and other invasives outcompete native organisms will also help us understand more about how cancer works and how we can fight it. Science is an amazing thing and our natural world is full of complex connections we don't yet understand. Any increase in our understanding of the world around us will lead to new discoveries ahead.